Invite the grandkids for your next camping trip in this travel trailer that can comfortably sleep ten people each night! 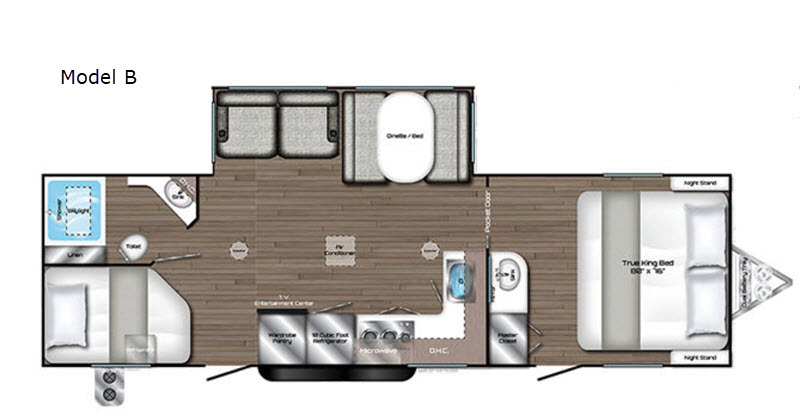 The kids will love climbing into the bunk beds and with the rear corner bath right next to the bunks, it's super convenient for the little ones to use the restroom at night. You'll appreciate your own private bedroom at the front of the unit that includes your own exterior entry door, a master closet, plus a vanity with a sink to wash up before dinner. Within the slide out, there is plenty of seating space on the sofa or the dinette, and you'll find additional sleeping space here as well. On those rainy days everyone can watch a movie on the 40" LED TV which has its own entertainment center. 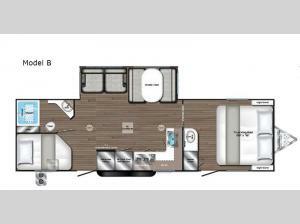 Come see why this Evoke travel trailer is perfect for you! With any Evoke travel trailer by Travel Lite you will be pleasantly surprised by the modern look and luxury of these units. Each model includes LED lighting throughout, including an LED accented mirror medicine cabinet in the bathroom, plus Infinity Woven vinyl flooring, which is scratch and water resistant. You'll find Granicote countertops and tables, slow-close cabinet technology, stainless steel Furrion appliances, plus a 10 cu. ft. double door refrigerator for all you perishables. Outside the Smart Awning features LED lighting and wind sensors, which recognizes when its too windy and automatically retracts, preventing any damage to your unit, and the electric tongue jack allows you to set up camp quickly and start relaxing sooner!